Speaking as a theatre nerd, one of the joys of having friends around the world who are fellow nerds is that you hear about wonderful things happening on the other side of an ocean. Sometimes you're lucky and you can spend your savings to go see them for yourself, but more often, you heave a sigh and listen to their glowing reviews and resign yourself. But sometimes, if you're very lucky, a third option presents itself, and a tour is announced and you've suddenly got a shot at seeing for yourself what all the fuss is about. That's exactly what's happened with the Isango Ensemble's visit to Washington DC, thanks to the Shakespeare Theatre's ever-wonderful presentation series. From September 12-21, South Africa's Isango Ensemble is making its home in the Lansburgh theatre, and to be quite frank, if you know what's good for you, you'll be there, too. They've brought two productions and are performing them in repertory: adaptations of Mozart 's The Magic Flute and Shakespeare's poem Venus and Adonis. Both productions use the same simple, raked set of corrugated iron, wood, and scaffolding. Both also display a mastery of the best elements of storytelling: language, music, dance, and the transformative power of the human body. I happened to see their adaptation of The Magic Flute first. Because I'm a nerd for opera as well as theatre, I should tell you that Mozart's opera is probably one of my all-time favorites. 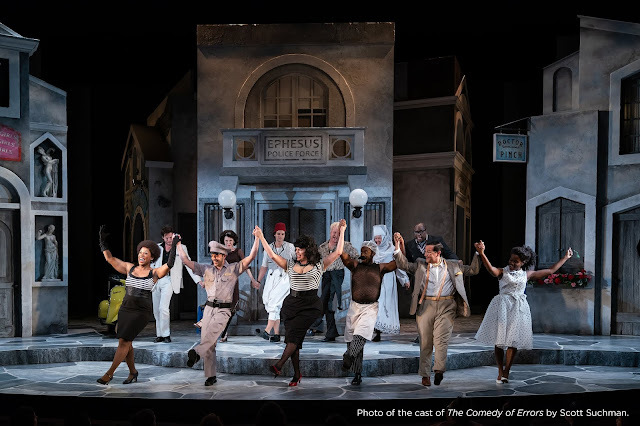 I didn't know exactly how director Mark Dornford-May had adapted the opera, but as Mandisi Dyantyis took center stage to conduct the overture and the members of the ensemble gathered around the eight marimbas at stage right and left, I started to get the idea. Typically, conductors face their musicians, which means the audience is rarely privy to those smaller gestures and expressions shared between artists. Not so here. Instead, thanks to a projected live feed of Dyantyis' face, I could see that his face echoed my own smile. It was a pleasant surprise, and there were more to come. I could go into raptures about this adaptation at length, telling you just how powerful a plethora of tiny moments became in the ensemble's skilled hands- for example, during Tamino's (Mhlekazi Mosiea) first aria as he falls in love with Pamina's picture, we see Pamina herself (Zolina Ngejane) appear on the upper level. More importantly, we see her dance. She's more than a pretty face, an object of desire; before we ever hear her sing, she's a real woman with a body and with a life of her own. She's beautiful, and when she's filled with joy- she dances. It's so simple, but it feels extraordinary. It's an old truism of musical theatre that when feelings become so great that words can't capture them adequately, you dance, but it's never felt more true than in these two productions. I could also mention the many times that the ensemble's voices become their own orchestra, supplemented with clapping, slaps, or foot-stomping. I could talk about the delicious liberties taken with "Der Hölle Rache" (probably the opera's most famous aria), because the way Pauline Malefane (also one of the arrangers and music directors) plays with tempi in that piece are extraordinary. But honestly? I don't want to spoil it for you. I need you to see this piece, and I need you to discover it the same way I did. I want you to gasp the way I did when Tamino first plays the flute. I knew Magic Flute much better going in than I knew Venus and Adonis, and I suspect the same will be true for much of the audience. This second adaptation is a different chance for the ensemble to flex their wings- instead of relying upon Mozart, Dyantyis is able to create his own haunting melodies for Venus' doomed love for Adonis. Dornford-May (adapting and directing again) uses a number of beautiful devices of stagecraft, linking the seven women who portray Venus together and to the rest of the ensemble through one piece of cloth and the simple effect created through singing together. That the actors use even more isiXhosa in this piece than in the more familiar Magic Flute is a testament to the actors' skill- most of the audiences in the Lansburgh may not have understood the words, but their meaning was never lost. I cannot recommend these productions highly enough. Both Flute and Venus serve to remind us that the heart of theatre is not in spectacle, or even truly in story, but rather in sharing humanity between actor and audience. The Isango Ensemble's performances never seek to truly convince us that there's a man riding a horse across the stage, or that a fire-breathing monster is lurking underneath the floorboards. Instead, those moments are concerned with how we understand and relate to the character onstage, whether it's a handsome Tamino or a lovesick Venus. When even the orchestra joins in the dance, we're reminded that we go to the theatre seeking a connection with other human beings through story, and thankfully, the Isango Ensemble is here to joyfully remind us and to invite you to join the celebration and the heartache and to rediscover our shared humanity.